This is probably the most basic and popular of all the flash drives we do here at C L Promotions our Popular usb flash drive with logo. It comes in various memory sizes and different shapes and styles. All of the flash drives we sell here come with plenty of room to diplay your business details and company logo, printed in one colour and one position. So give them away to your customers and friends as a promotional or Christmas giveaway and always stay advertised. 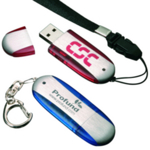 Other promotional and personalised items besides our Popular usb flash drive with logo click here. To find out more about our Popular usb flash drive with logo click here and fill in the contact form and we'll get straight back to you.